While browsing YouTube today, I stumbled across an interesting video uploaded by Odin1899. It is called the Unofficial AmigaOS 3.5 Promotion Tape and it is (you guessed it) a promotion for AmigaOS 3.5. 😉 I’m not exactly sure about the release date of the video, but I don’t think 2001 is correct, since AmigaOS 3.5 was released earlier. My guess is that it is from 1999 or 2000. 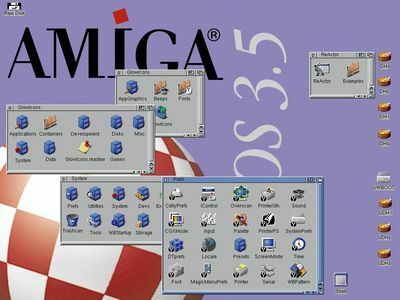 I remember buying AmigaOS 3.5 in the year 2000 and that I was very happy with it – it was a big step forward from 3.1 as far as I can remember. 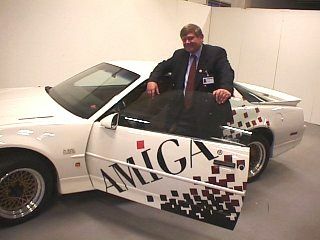 I have to mention that the video features footage of Petro Tyschtschenko, the former President of Amiga International. He is both a legend and a hero in my eyes, as he kept the momentum going in the 90’s and onwards. He’s a very charismatic person that brought us a lot of hope back then. Anyway, here’s the video! Enjoy the show folks! Oh my, that car! I would drive it around. The car looks very, very cool. I’d like to drive it as well. I had almost forgotten about those Amiga phone covers. Weren’t they custom made buy a guy who airbrushed them? I remember that I seriously considered to purchase one. The animation in the end looks very dated! I can almost not believe that it’s from 99-00! Hehe.. I agree. The animation looks pretty dated today. A lot has happened since then, that’s for sure. I wonder how we will look at stuff made today in 10 to 12 years time.. The company website is still up, so I guess it may be possible to order them. Thanks for finding information on the Amiga mobile phone skins. 🙂 I’ll have a look at the links you provided – maybe I’ll even purchase one. 😉 An interview would be interesting… stay tuned! Cool video! This is the first time I’ve seen it. Thanks for sharing. He-he, it’s no lie that the Windows Setup Installation Process could be a real pain back then… 😉 That blonde Amiga-girl doesn’t seem to have problems with OS 3.5 whatsoever! 😀 LOL!